In January 2012, we drove Lexie to Florida for her first big-girl job away from home. She had just finished student teaching in Fort Collins, and in early December as she and I were talking about what was next for her, she regretted not having done a Disney college internship. During Lexie’s sophomore year, I’d talked to her about an internship after one of my CSU students mentioned how much she had enjoyed her time at Disneyworld. It was a conversation in passing that didn’t surface again until December 2011 when it was clear that a semester of substitute teaching was the best life had to offer. What would it hurt to see if an internship were still a possibility? She applied with literally days to spare before the deadline, and 2 weeks later, she was in. Will and I drove her to Florida at the end of January. In this pic, I’m nursing a world-class sinus infection. 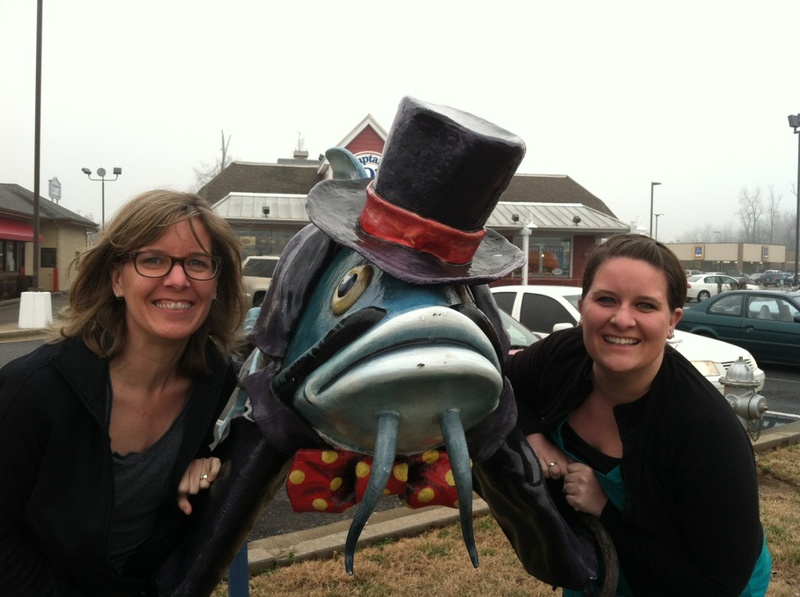 Our road-trip goal is to pose with a fiberglass figure in every state we cross. We’re in Alabama here with a catfish. In a top hat. There’s really not much else I can say. So on to February. This is my son Austen who has had a serious serious streak since he was born. 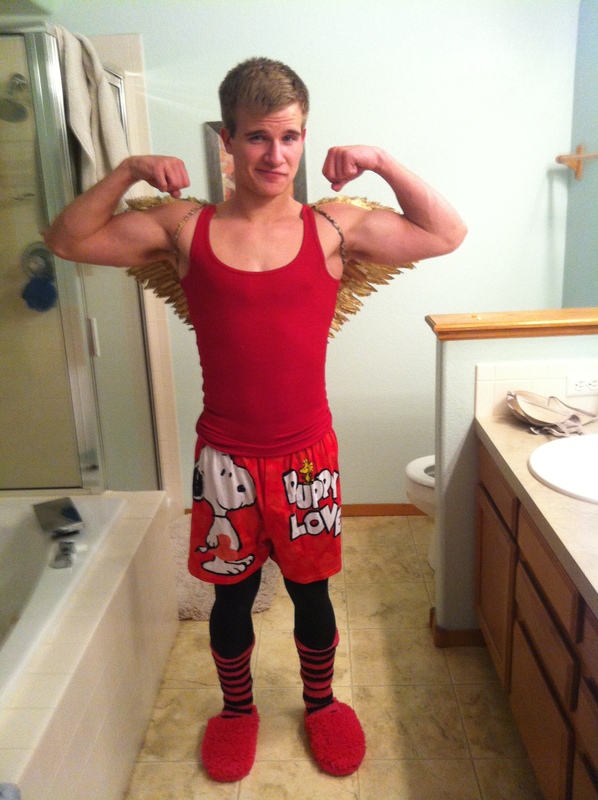 Yet it’s not so ingrained that he’s afraid to wear something like this to school on Valentine’s Day. And I love that about him so much. I’m cheating by showing two pics in March, but they are too good to miss. 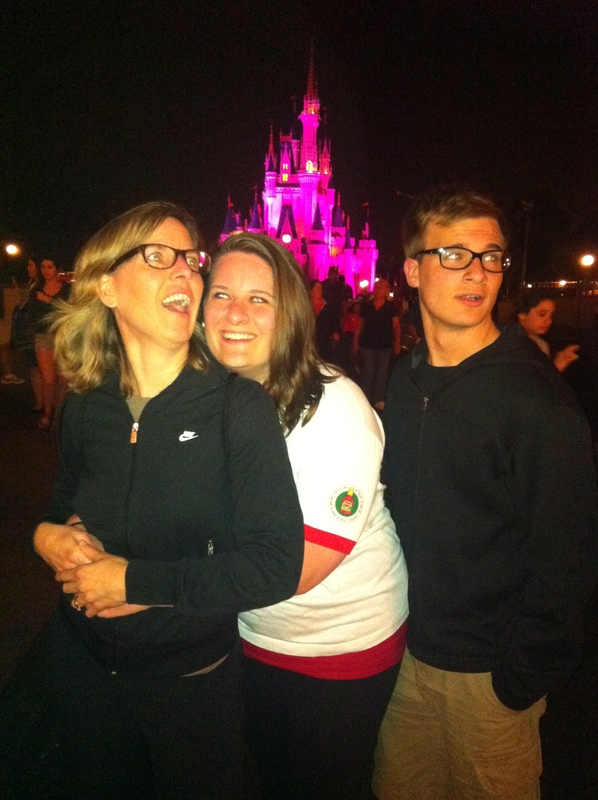 The first is our awkward family photo, starring Lexie, Austen, and me at the Magic Kingdom during spring break. Will is taking the picture, and Lynley is still in school at CU, undoubtedly cursing us under her breath. 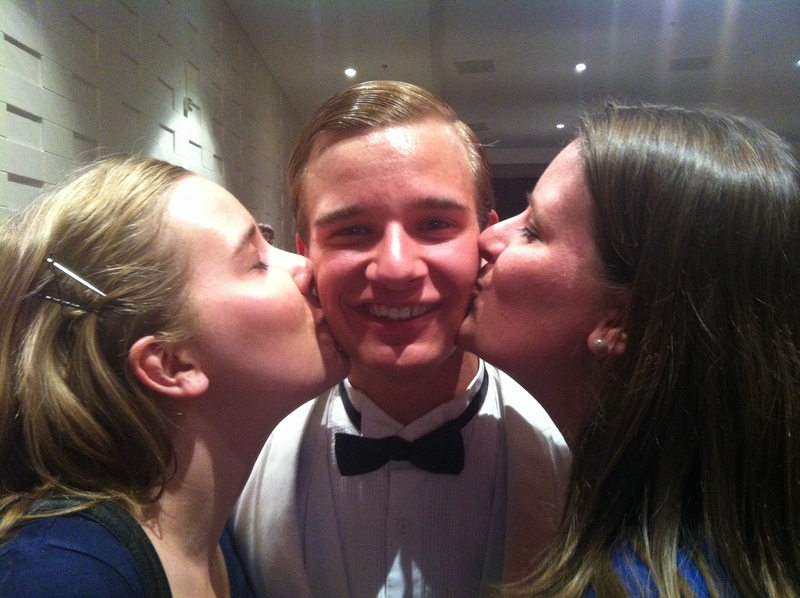 Also in March, Austen starred as the skinniest Daddy Warbucks ever in Annie at Rocky Mountain High School. Lexie managed to get time off to return to FoCo to see the show. Here, she and Lynley play proud big sisters on opening night after the show. In April, my best friend from Oklahoma called me and said, “I have tickets to Garth Brooks’ show in Vegas. 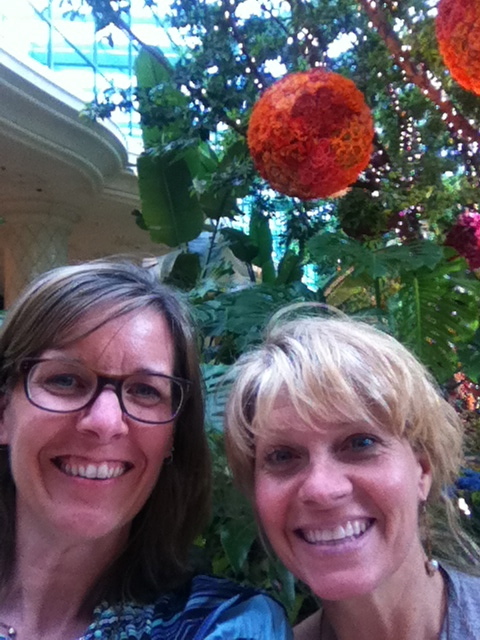 All you have to do is get here.” So I did, and here we are in the lobby of the Wynn. At this point in the day, I have already lost my purse on the shuttle, been locked out of my hotel room, and sweated through an outfit. And yet, I am happy. Such is friendship. May. This is a truly horrible photo, and I am, again, truly happy in it. 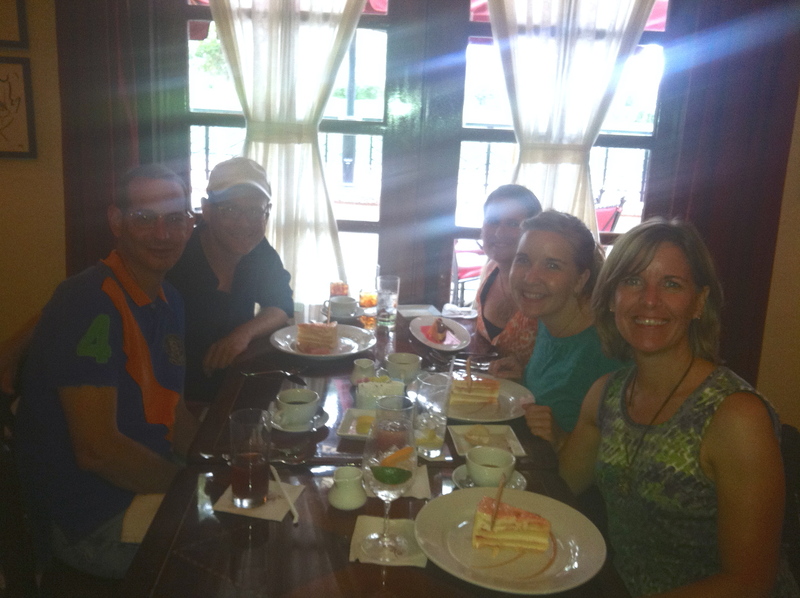 Lynley, Lex, and I are again in Disneyworld, this time for lunch at the Brown Derby at Hollywood Studios with another Oklahoma best friend, Clark, and his partner Jason. We laughed till we cried on multiple occasions that week, including the day we ate breakfast at Cinderella’s Castle and our presence as the “Jobe Family” proved an anomaly to the rest of the castle crowd. But if “family” means you really, really love each other, then all week long, that was us. And, oh my goodness, the ball is dropping, so I’ll finish the last 6 months tomorrow.